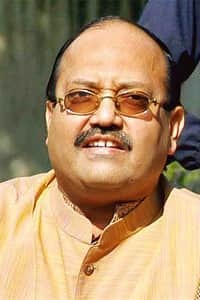 New Delhi: Samajwadi Party general secretary Amar Singh on Friday denied contributing any money to the William Jefferson Clinton Foundation, which has listed him as one of the top donors on Thursday. “I am denying it," he told Mint in an interview. “I cannot react to media speculations. Anything can be written about anybody and I do not think I should react to it." “Let me add that I feel privileged to be on the list of friends (former US president Bill and wife Hillary) Clintons have," Singh added. “It is a matter of happiness that I am friends with the Clintons." As part of a deal that cleared the way for Hillary Clinton to be nominated by US President-elect Barack Obama as the next secretary of state, Bill Clinton released a list of 205,000 donors on the foundation’s website. A list of top donors, those who gave $100,000 (about Rs47 lakh today) or more, reported by The Wall Street Journal shows Singh as having given between $1 million and $5 million. One likely explanation for why Singh’s name appears on the list is that he actively collected donations from friends and supporters on behalf of Clinton and then gave the money to the foundation. Mint couldn’t immediately ascertain how the foundation treats those who pool donations and then give the proceeds. Former US president Clinton had in September 2005 visited Lucknow, the capital of Uttar Pradesh, when Singh’s Samajwadi Party was in power, to inaugurate a state rural health programme. Then UP chief minister Mulayam Singh Yadav of the Samajwadi Party had hosted a dinner for Clinton that was also attended by Singh’s close friends Reliance-Anil Dhirubhai Ambani Group chairman Anil Ambani and Bollywood icon Amitabh Bachchan. The foundation’s top donors list also shows Reliance Europe Ltd, part of Mukesh Ambani’s Reliance Industries Ltd, as having donated money. Other companies and donors with India links on the list include Tulsi Tanti’s Suzlon Energy Ltd, the India Today media group, Ranbaxy Laboratories Ltd, Ajit Gulabchand of Hindustan Construction Co., deceased hotelier Lalit Suri, and industry lobby Confederation of Indian Industry (CII). ArcelorMittal’s L.N. Mittal is also on the list of $1million and $5 million donors.